The Pet Shop Boys' third live album, delivered on two CDs, appeared in April 2019. Like its predecessor Pandemonium, it was packaged with a video set of the same name (in this case a DVD and their first-ever Blu-ray), all of which documented the Boys' July 2018 shows at the Royal Opera House in London. 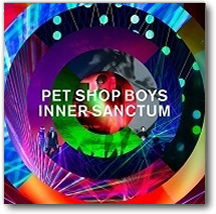 The Royal Opera House shows were titled Inner Sanctum; hence this release's title. I'm actually a bit reluctatant to count these CDs among the PSB albums because it breaks the previously inviolate single-word album-title rule for their "non-special-project" albums (that is, not counting such things as their Battleship Potemkin soundtrack and their ballet The Most Incredible Thing). But since I've long counted the absolutely parallel Pandemonium as an album, it would be inconsistent of me not to. In a conflict between seeming inconsistencies—theirs and mine—the Pet Shop Boys naturally win. Note: The following links will take you to the sections for the albums on which each song originally appeared. Please keep this in mind for "navigational" purposes.